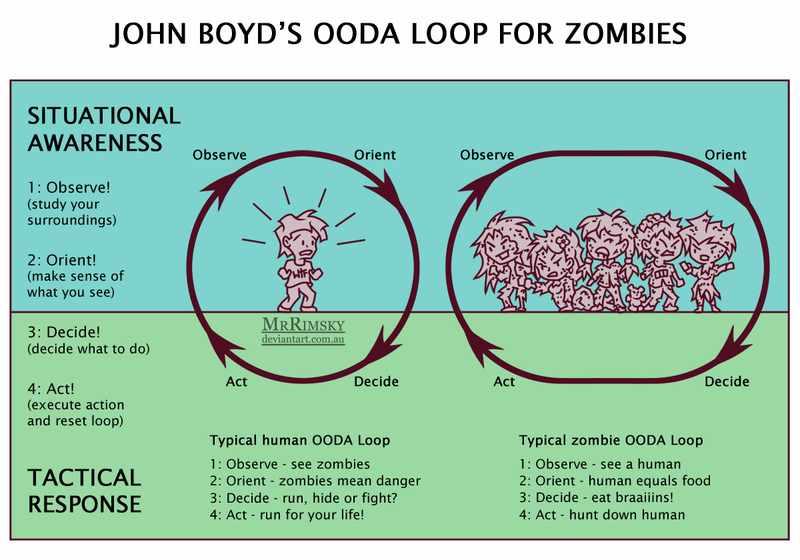 So having got to grips with a the Cooper colour code it is time for John Boyd's OODA loop. Like Jeff Cooper, John Boyd served in the military. In Boyd's case he was a fighter pilot who went on become a military strategist. His OODA loop was a radical new theory that has influence such diverse fields as ligation, reality TV and sports. Ok so it may not look like much but Boyd's theory is actually very complex, this is a very, very simple version. What is interesting is you can see how the first two steps are about situational awareness while the next two steps are about tactical decision making. The OODA loop is not a one time thing, you are constantly going around and around the loop as your situation changes, causing you to reassess your decisions. In a fight the goal is to complete your loop before your opponent, because then you can execute your attack before they can. There are ways you can speed up your loop and slow down your opponent's.